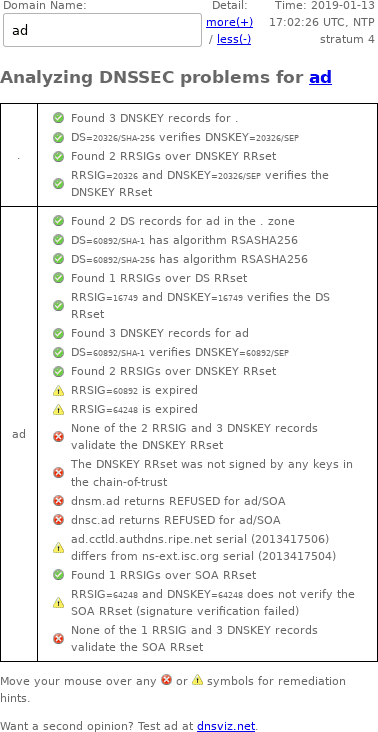 This page gives some details on the ad TLD (Andorra) DNSSEC outage on January 13, 2019. This is at least the 4th DNSSEC outage for Andorra. zonemaster.net archived "The apex DNSKEY RRset was not correctly signed." ad. 899	IN	NS	ns-ext.isc.org. ad. 899	IN	NS	ad.ns.nic.es. ad. 899	IN	NS	ad.cctld.authdns.ripe.net. ad. 899	IN	NS	dnsc.ad. ad. 899	IN	NS	ns3.nic.fr. ad. 899	IN	NS	dnsm.ad. ;; No DNSKEY record found for ad.